Situated in San Bartolome, this cottage is within 3 mi (5 km) of Tanit Ethnographic Museum, Deiland Shopping Center, and Campesino House Museum. Pocillos Beach and Rancho Texas Park Zoo are also within 6 mi (10 km). Situated near the beach, this guesthouse is within 9 mi (15 km) of Playa Chica, Rubicon Winery, and Cesar Manrique Foundation. Santa Barbara Castle and AquaPark Costa Teguise are also within 12 mi (20 km). Situated in San Bartolome, this apartment building is within 3 mi (5 km) of Tanit Ethnographic Museum, Deiland Shopping Center, and Campesino House Museum. Pocillos Beach and Rancho Texas Park Zoo are also within 6 mi (10 km). Situated in San Bartolome, this apartment building is 1.7 mi (2.7 km) from Deiland Shopping Center and 2.6 mi (4.1 km) from Tanit Ethnographic Museum. Pocillos Beach and Rancho Texas Park Zoo are also within 6 mi (10 km). How Much is a Hotel Room in Guime? Hotels in Guime start at $125 per night. Prices and availability subject to change. Additional terms may apply. Traveling to Guime? There is a wide variety of apartments and hotels from which you can choose. About 89 hotels and apartments are on Travelocity within a 6-mile (10-kilometer) radius from Guime's center. It doesn't matter that Guime doesn't boast being home to a varied list of Travelocity-listed hotels in the heart of the central precinct, Villa Senella is located in a great spot to work for wise travelers. 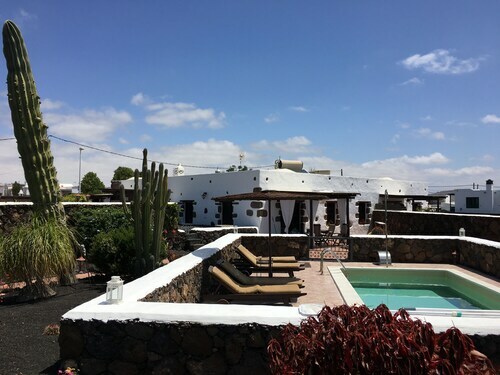 5 miles (8 kilometers) away from the middle of Guime, you will find the Coral Villas Lanzarote. The Coral Deluxe Villas is approximately 18 miles (28 kilometers) away. Alternative hotels include the Princesa Yaiza Suite Hotel Resort and the Gran Hotel Atlantis Bahia Real G.L.. When you have some spare time, adventurous travelers should explore more of the Canary Islands region. Canary Islands is home to beaches, and commonly visited tourist destinations are old towns. Bold visitors may involve themselves in mountain biking and mountain climbing here. 15 miles (24 kilometers) away from Guime, you can reach Playa Blanca, which boasts Pechiguera Lighthouse and Roja Mountain. A few Playa Blanca rooms include the Dream Gran Castillo Resort and Villas Heredad Kamezí. 4 miles (6 kilometers) southwest of Guime, you can also stay at Puerto del Carmen, which is home to the Seaside Los Jameos Playa and Alondra Villas & Suites. When you visit Puerto del Carmen, you might like to visit the Gran Casino de Lanzarote and Fariones Sports Center. Simply because you're visiting somewhere new, who's to say you can't enjoy your love of stadium sports. You will find Sports City of Lanzarote 4 miles (6 kilometers) to the east of Guime. Modern travelers who like the idea of booking accommodation close to the action, reserve a room in the Barceló Lanzarote Resort or Arrecife Gran Hotel & Spa. 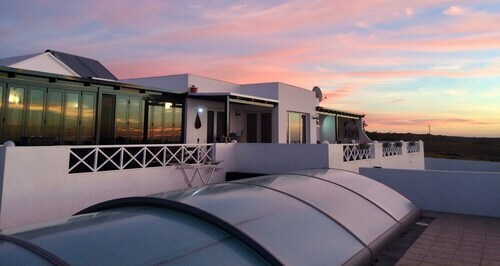 Lanzarote Airport can be found 2 miles (3 kilometers) outside Guime's downtown precinct. Enlightened visitors who hope to find a room nearby can look into a night via Travelocity at the VIK Hotel San Antonio or Hipotels La Geria. 5.0 Amazing localization and staff, great breakfasts. Whole experience was perfect, the island of Lanzarote is amazing. Hotel is suited in a perfect localization 10 meters from the beach. Staff was really helpful, we had a lots of questions about transport etc. and they all helped us with it. The only problem was with the Wi-Fi, it was really bad, even to the point it wasn't usable, the pages were not loading etc. Also we didn't have a duvet, only a duvet cover and the blankets? That was weird.